For the newspaper archive, see morgue file. "Mortuary" redirects here. For other uses, see Mortuary (disambiguation). Mortuary early 14c., from Anglo-French mortuarie "gift to a parish priest from a deceased parishioner," from Medieval Latin mortuarium, noun use of neuter of Late Latin adjective mortuarius "pertaining to the dead," from Latin mortuus, pp. of mori "to die" (see mortal (adj.)). Meaning "place where bodies are kept temporarily" first recorded 1865, a euphemism for earlier English term "deadhouse." Morgue from the French morgue, which means 'to look at solemnly, to defy'. First used to describe the inner wicket of a prison, where new prisoners were kept so that jailers and turnkeys could recognize them in the future, it took on its modern meaning in fifteenth-century Paris, being used to describe part of the Châtelet used for the storage and identification of unknown corpses. Morgue is predominantly used in North American English, while mortuary is more common in British English, although both terms are used interchangeably. The euphemisms “Rose Cottage” and “Rainbow’s End”  are sometimes used in British hospitals to enable discussion in front of patients, the latter mainly for children. A person responsible for handling and washing bodies is now known as a diener, morgue attendant, or autopsy technician. In some countries, the body of the deceased is embalmed before disposal, which makes refrigeration unnecessary. In many countries, the family of the deceased must make the burial within 72 hours (three days) of death, but in some other countries it is usual that burial takes place some weeks or months after the death. This is why some corpses are kept as long as one or two years at a hospital or in a funeral home. When the family has enough money to organize the ceremony, the corpse is taken from the cold chamber for burial. In some funeral homes, the morgue is in the same room, or directly adjacent to, the specially designed ovens, known as retorts, that are used in funerary cremation. Some religions dictate that, should a body be cremated, the family must witness its incineration. To honor these religious rites, many funeral homes install a viewing window, which allows the family to watch as the body is inserted into the retort. In this way, the family can honor their customs without entering the morgue. A waiting mortuary is a mortuary building designed specifically for the purpose of confirming that deceased persons are truly deceased. Prior to the advent of modern methods of verifying death, people feared that they would be buried alive. To alleviate such fears, the recently deceased were housed for a time in waiting mortuaries, where attendants would watch for signs of life. The corpses would be allowed to decompose partially prior to burial. Waiting mortuaries were most popular in 19th-century Germany, and were often large, ornate halls. Morgue is used to refer to the room in which newspaper or magazine publishers keep their back issues and other historical references, as they serve a similar purpose to human morgues. See Morgue file. Mortuary can also refer to a funeral home. 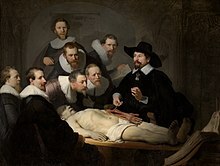 Wikimedia Commons has media related to Morgues. ^ Morgan, Oliver (2006). Management of Dead Bodies after Disasters: A Field Manual for First Responders. Pan American Health Organization. p. 49. ISBN 92 75 12630 5. ^ "London mortuaries install more fridges for obese bodies". BBC. 27 June 2018. Retrieved 7 September 2018. ^ Roach, Mary (2003). Stiff: The Curious Lives of Human Cadavers. W. W. Norton & Company. ISBN 978-0-393-32482-2.